This ground-breaking textbook is the first to cover the new and rapidly developing field of occupational health psychology. Stavroula Leka is an Associate Professor in Occupational Health Psychology in the Institute of Work, Health & Organisations at the University of Nottingham, U.K. She is Director of the Institute's Masters Degree in Occupational Health Psychology. Her primary research interests are the application of occupational health and safety knowledge and policy in the workplace, and psychosocial risk management. She is Chair of the Education Forum of the European Academy of Occupational Health Psychology. Jonathan Houdmont is a Lecturer in Occupational Health Psychology in the Institute of Work, Health & Organisations at the University of Nottingham, U.K. He is Director of the Institute's Masters Degree in Workplace Health. His current research interests focus on legal and policy issues in occupational health, as well as education and training in occupational health psychology. He is Executive Officer of the European Academy of Occupational Health Psychology. 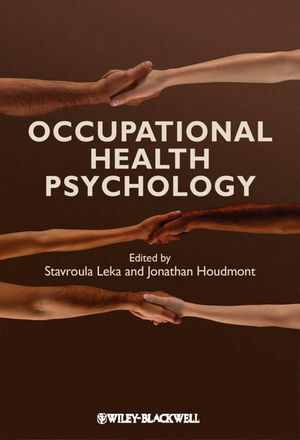 1 An Introduction to Occupational Health Psychology (Jonathan Houdmont and Stavroula Leka). 2 Work-Related Stress: A Theoretical Perspective (Tom Cox and Amanda Griffiths). 3 Work Organization and Health (Michael P. O’Driscoll and Paula Brough). 4 Interventions to Promote Well-Being at Work (Raymond Randall and Karina Nielsen). 5 Psychosocial Risk Management at the Workplace Level (Stavroula Leka and Tom Cox). 6 Workplace Health Promotion (Andrew J. Noblet and John J. Rodwell). 7 Positive Occupational Health Psychology (Arnold B. Bakker and Daantje Derks). 8 The Physical Workspace: An OHP Perspective (Phil Leather, Tony Zarola, and Angeli Santos). 9 Corporate Culture, Health, and Well-Being (Gerard Zwetsloot and Stavroula Leka). 10 Research Methods in Occupational Health Psychology (Toon W. Taris, Annet H. de Lange, and Michiel A. J. Kompier). 11 Future Directions in Occupational Health Psychology (Jonathan Houdmont and Stavroula Leka).